A flavor-packed gourmet recipe that is sure to impress. - Combine orange juice, red wine and teriyaki sauce into large bolw or baking dish. 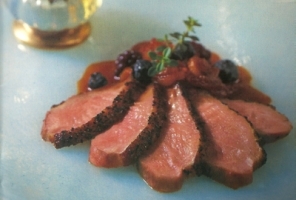 - Score duck breast skin (be careful not to pierce meat) with tip of a sharp knife and marinate for 30 minutes. - Slice dried apricots and let soak in brandy for 30 minutes. Drain brandy. - Mix sugar and water in small saucepan over low heat until sugar is dissolved. Bring mixture to boil and maintain heat until mixture turns dark amber color; about 7 minutes. - Stir in chicken broth and both vinegars. Simmer about 18-20 minutes, until mixture is reduced. Remove from heat and mix in brandied apricots and fresh ginger. Let stand. - Remove duck breasts from marinade and season liberally with salt. Rub peppercorn and thyme over duckling skin. - Place duck breasts skin side down in large skillet over medium heat. Cook about 12 minutes until skin is crispy and golden brown. Turn breasts over and continue cooking another 5-6 minutes for medium rare. Remove from pan and let rest about 5 minutes. - Return sauce to low heat and whisk in chilled butter, small pieces at a time. When butter has melted into mixture, season with salt and pepper and add blueberries and blackberries. - Slice duck breasts into medium thick slices and fan on place; 4-5 slices per person. Spoon berry sauce over duck. Serve immediately.